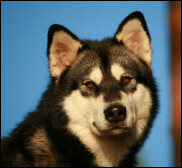 Yepa is our first malamute, who came to enlighten our live 3.6.2006. Yepa is from kennel Neatut, and her official name is Neatut Ongomiark. Yepa's calling name means snow princess in apache indian language. Yepa isn't breeding quality because of his eye problems with cataract and distichiasis. 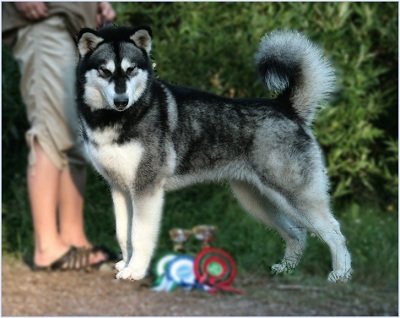 Yepa's pedigree includes many working malamutes, for instance one of few agility malamutes in Finland. Yepa's parents are sire FI MVA Mukluk Biwabuk and dam Keikewabic's Nanabijou REK3. Yepa is fearless, playful, open and extremely loving towards people. Even though she has very determined temperament, she is quite humble and submissive, at least mostly. "I-don't-understand-a-word-you-sayin"-moments hits her sometimes... Yepa is very greedy towards food and she is even ready to fight for it. Yepa is very talkative, she talks a lot with many different voices. She likes to howl and she don't usually bark. Yepa is social, but she needs her own "haven" around her and don't want especially strange females inside of it. Yepa has good structure: strong bones, excellent proportions and topline, good coat and lovely long tail. Angulations are good in rear, front is slightly straight. Yepa's head and muzzle could be stronger. Yepa moves very well with strong drive and excellent gait lenght. Yepa has been teaching our other malamutes to work as our first malamute. Yepa is hard working female, who can keep up 20 km/h pace with her gait. Yepa is also very good weight puller. 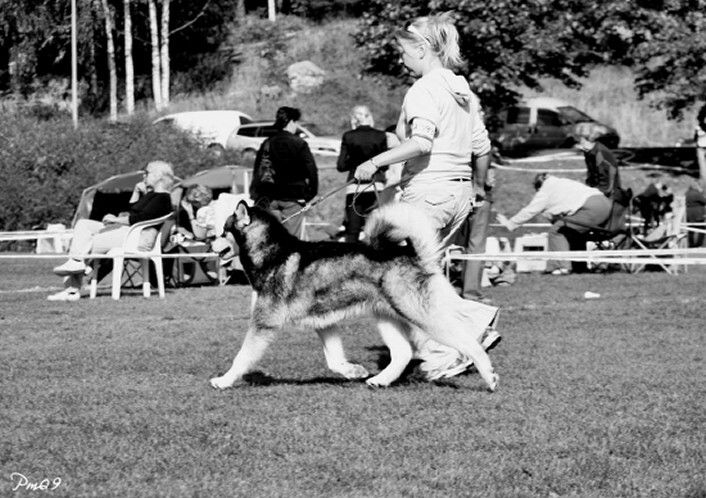 She has won Alaskan malamute club's Winter meetings Weight pull competition in year 2009, when she was participating first time. In year's 2010 winter meeting she was 2nd in total competition and best female with result 18,8 x her own weight. In year 2012 Yepa was 3rd in total competition and 2nd best female in Alma's weight pull competition with result 500 kg / 18,52 x own weight. Yepa has many KVK1-results from official Weight pull-tests and from official sled dog tests she has REK2- and REK3-results. In shows Yepa has gained Finnish Champion-title. In year 2015 Yepa got several Veteran BOB-wins and same time also multiple BOB- or BOS-wins. Her show year's ended with Veteran Winner 2015-title from Finnish Winner Show at December. In year 2017 she went 4 shows, where she was 4 times BOB-veteran, 1 x BOB and even BIS3-veteran. She has been in excellent condition for her age (almost 10 years) and was running in our team, almost same kilometers than our younger dogs until 10 years. Yepa was in our race team at Ruunaa Race MD4-class in March 2016 in first two days and ran total 65 km in that race without any problems. Yepa's age then was 1 month shy 10 years! Thank you Anne and Jokke for this awesome girl!